Since I don't need to buy a new mattress or a new Honda, and since I live a couple of thousand miles away from where my sisters will be decorating graves tomorrow, I'm celebrating Memorial Day in the same way I have some some years now: by observing the annual Opening of the Swimming Pool at my condo complex. Extra Special p3 Mention this week goes to Steve Benson for his effective way of reminding us that Memorial (née Decoration) Day began as a commemoration of the military dead from the Civil War. (And, of course, one of the many entrants in the "Who Started Decoration Day?" Sweepstakes is the group of freed slaves who decorated the Union graves in Charleston SC in 1865. And congratulations to the winners of the 2016 Reuben Awards, including p3 Sunday Toons famliar faces Michael Ramirez and Ann Telnaes. Also delighted to see recognition going to Paul Coker Jr. and Sergio Aragones, two MAD magazine artists whose legends have loomed large since my childhood days. Today's toons were inducted into service from the week's offerings at McClatchy DC, Cartoon Movement, Go Comics, Politico's Cartoon Gallery, Daryl Cagle's Political Cartoons, About.com, and other fine sources of toony goodness. p3 Picks of the week: Nick Anderson, Darrin Bell, Clay Jones, Chan Lowe, Dan Wasserman, Signe Wilkinson, Matt Weurker, and Monte Wolverton. p3 Certificate of Harmonic Toon Convergence: Arend Van Dam and Joe Heller. p3 Award for Best Adaptation from Another Medium (tie): Mike Luckovich, John Deering and Steve Breen. Ann Telnaes produces one of the funniest Paul Ryan caricatures I've seen while making the point that the House of Representatives treats the District of Columbia and its taxpaying residents as something somewhere between a fiefdom and a principality – although it's not, and likely never will be, a state in the way she suggests. Mark Fiore shares several advances at frontiers of science – and one guy who's famous for to fence in the border. Self-diagnosis is always a risky business, but I think I may be coming down with what Tom Tomorrow describes here. Keith Knight brings back a quiz. Note that successfully passing the exam involves knowing this vital piece of information: San Francisco has amazing Mexican food. Reuben Bolling put the light on a problem several obsesrvers have noticed: The sanctimonious opposition to the whole trans-potty thing has a very distinct gender one-sidedness to it. Red Meat's Ted Johnson embarks upon the life aquatic. You'll never want to see "Speedo" and "doggy biscuits" in the same sentence again. Ever. Comic Strip of the Day has a mostly-animal post from earlier in the week. Come for the Shakespearean cows, stay for the North American mammal head gear and the resolution of property rights "country style." Come on in for a duck dinner – you bring the ducks! "I Yam What I Yam" (directed by Dave Fleischer in 1933) lets me continue the duck theme from CSotD's post, above. Technically, it's the first animated Popeye theatrical short (his previous appearance was in a Betty Boop toon, where la Boop's established brand was used to launch Fleischer's newest character. Uncredited: Musical director Sammy Timberg, William Pennell (singing the opening theme, "Strike Up the Band for Popeye the Sailor"), Billy Costello (Popeye), Bonnie Poe (The Slender One), and Charles Lawrence (J. Wellington Wimpy). Some version had about a minute of crude stereotyping of Native Americans edited out for television syndication beginning in the 1950s, but this appears to be the unedited version – consider yourself warned. Watch "I Yam What I Yam" at DailyMotion. 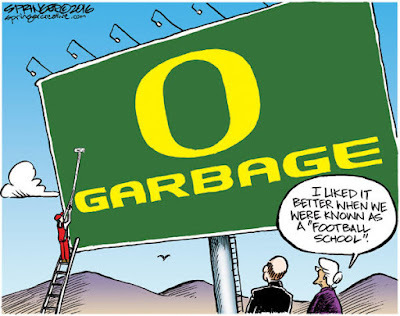 Ex-Oregonian Jack Ohman goes for it. Documented Ex-Oregonian Jen Sorensen tracks the fall from grand experiment to brand experiment..
Matt Bors looks in wonder at the mystery that is Donald Trump. All that's missing is the Mystery Mobile. Jesse Springer suspects that even P. T. Barnum may not have foreseen the Lamda Chi Alpha chapter at the U of O. Sometimes, apparently there is such a thing as bad publicity. Test your mastery of the toon-captioning Force at The New Yorker's weekly caption-the-cartoon contest. (Rules here.) And you can browse The New Yorker's cartoon gallery here.